The Canadian economy began 2018 on a rocky start, following the introduction of the Office of the Superintendent of Financial Institutions’ (OSFI) new mortgage stress test. However, a rebound is likely to occur in the June quarter, according to the Bank of Canada (BoC). Last Monday, Governor Stephen Poloz addressed the House of Commons Standing Committee on Finance about the BoC’s recently published Monetary Policy Report. “All told, we expect that the economy will grow by two per cent this year, and at a rate slightly above its potential over the next three years, supported by both monetary and fiscal policies,” Poloz said. The BoC said the composition of growth over the next quarter will shift, with a larger contribution from business investments and exports, and a diminished contribution from household spending. The implementation of the new mortgage stress test is one of the main culprits for slower-than-anticipated growth in the March quarter. If the central bank’s forecast remains on track, Poloz said interest rates will need to rise over time to keep inflation in check. Although interest rates remain very low relative to historical trends, further rate hikes could add more pressure on housing markets, especially those grappling with skyrocketing house prices and strained affordability. With a number of external forces weighing on the economy, such as uncertainty around trade conflicts and growing geopolitical risks, Poloz said interest rates may need to remain below the neutral range until these risks have waned. 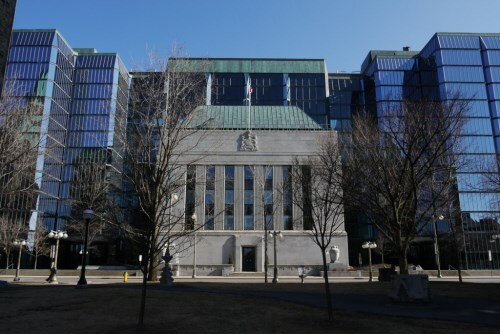 In the coming months, the BoC will monitor the economy’s sensitivity to interest rate movements and will consider the appropriate pace of interest rate hikes based on a data-dependent process of risk management.